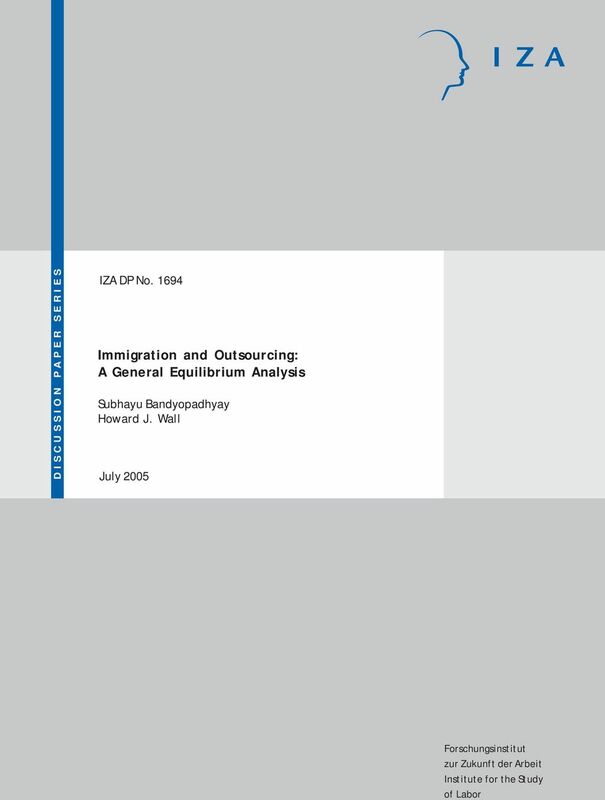 Download "Working Paper Immigration and outsourcing: a general equilibrium analysis"
3 Immigration and Outsourcing: A General Equilibrium Analysis Subhayu Bandyopadhyay West Virginia University and IZA Bonn Howard J. 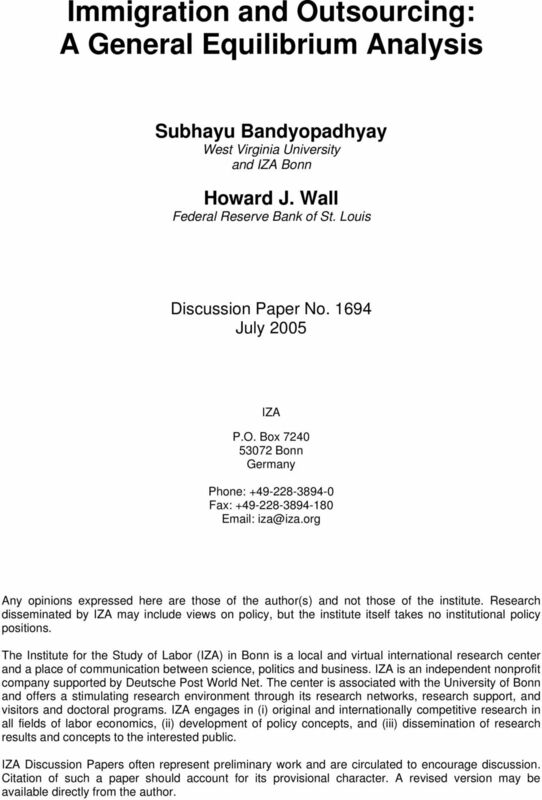 Wall Federal Reserve Bank of St. Louis Discussion Paper No July 2005 IZA P.O. Box Bonn Germany Phone: Fax: Any opinions expressed here are those of the author(s) and not those of the institute. Research disseminated by IZA may include views on policy, but the institute itself takes no institutional policy positions. The Institute for the Study of Labor (IZA) in Bonn is a local and virtual international research center and a place of communication between science, politics and business. IZA is an independent nonprofit company supported by Deutsche Post World Net. The center is associated with the University of Bonn and offers a stimulating research environment through its research networks, research support, and visitors and doctoral programs. IZA engages in (i) original and internationally competitive research in all fields of labor economics, (ii) development of policy concepts, and (iii) dissemination of research results and concepts to the interested public. IZA Discussion Papers often represent preliminary work and are circulated to encourage discussion. Citation of such a paper should account for its provisional character. A revised version may be available directly from the author. 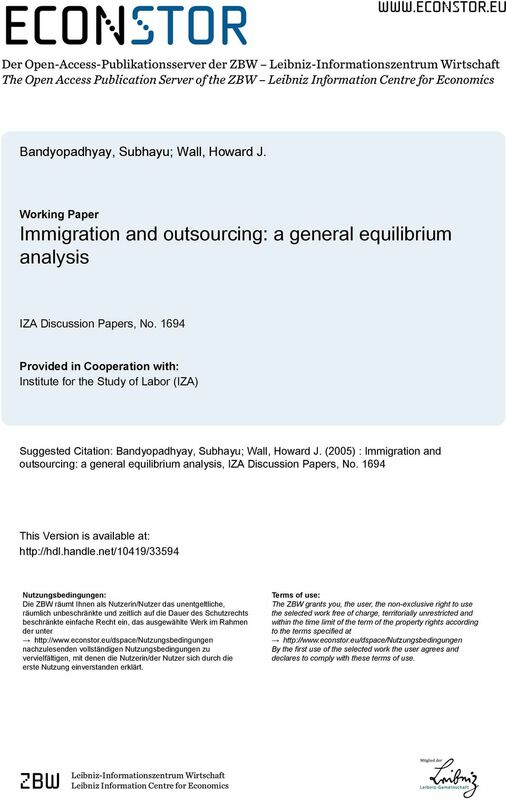 4 IZA Discussion Paper No July 2005 ABSTRACT Immigration and Outsourcing: A General Equilibrium Analysis This paper analyzes the issues of immigration and outsourcing in a general-equilibrium model of international factor mobility. 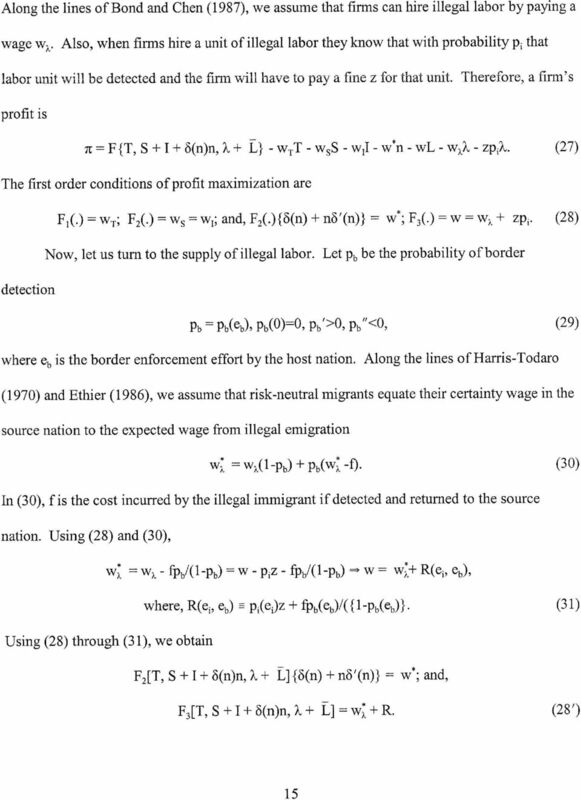 In our model, legal immigration is controlled through a quota, while outsourcing is determined both by the firms (in response to market conditions) and through policy-imposed barriers. 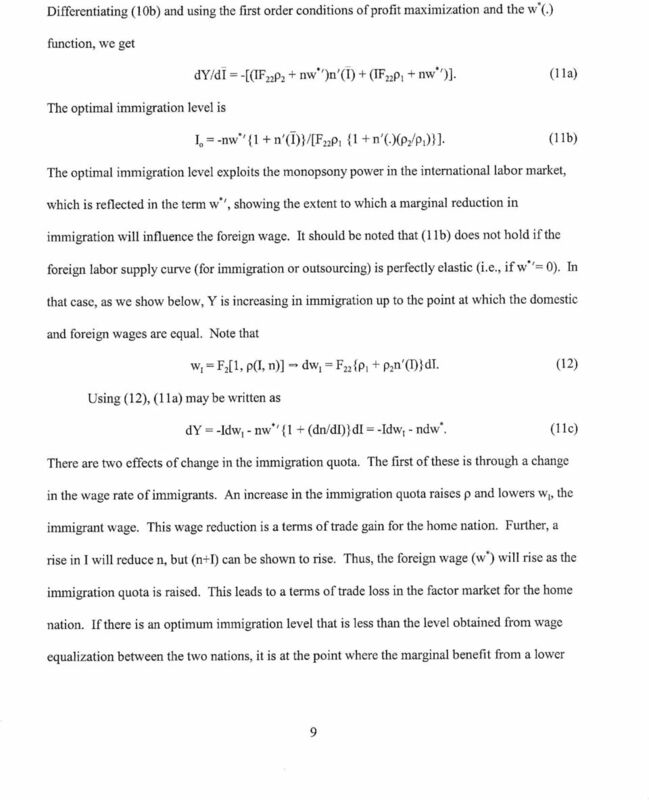 A loosening of the immigration quota reduces outsourcing, enriches capitalists, leads to losses for native workers, and raises national income. 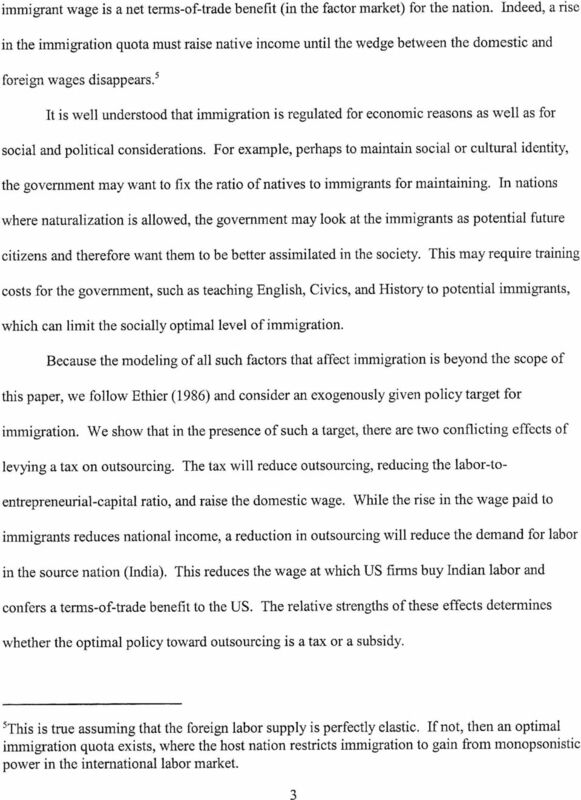 If the nation targets an exogenously determined immigration level, the second-best outsourcing tax can be either positive or negative. 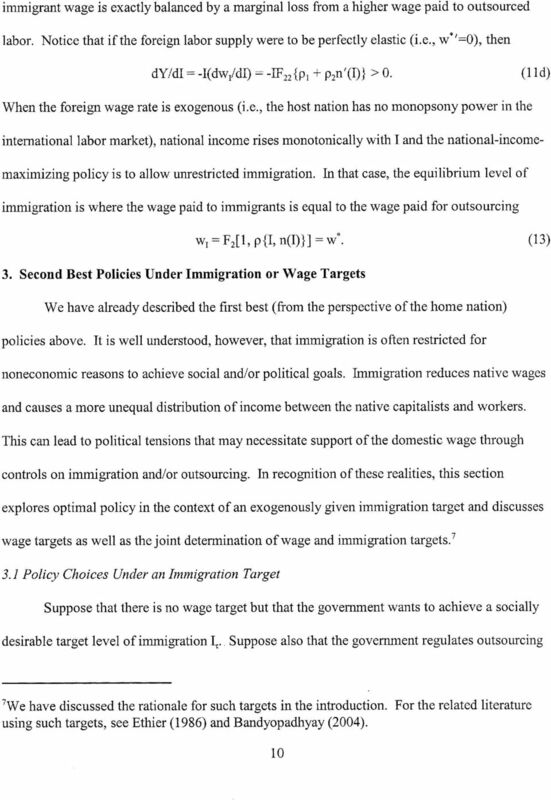 If in addition to the immigration target there is a wage target (arising out of income distribution concerns), an outsourcing subsidy is required. 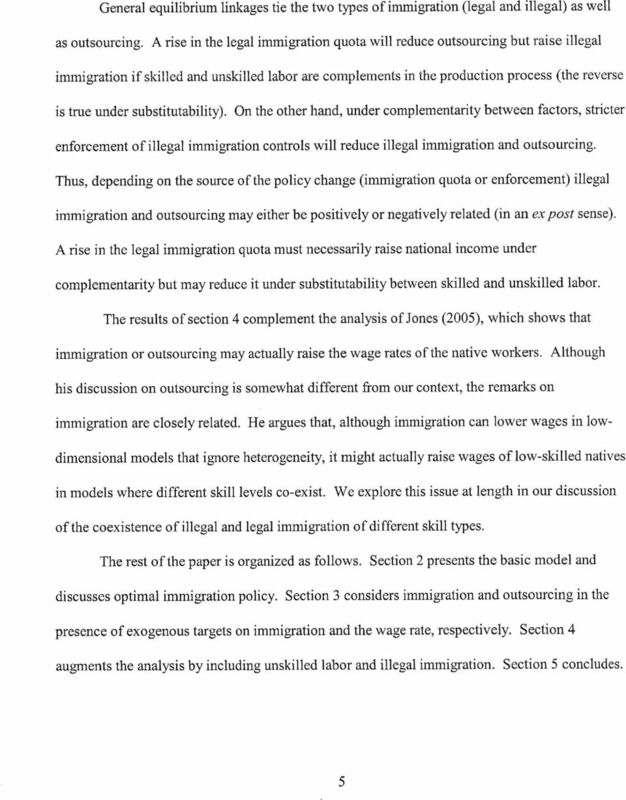 The analysis is extended to consider illegal immigration and enforcement policy. 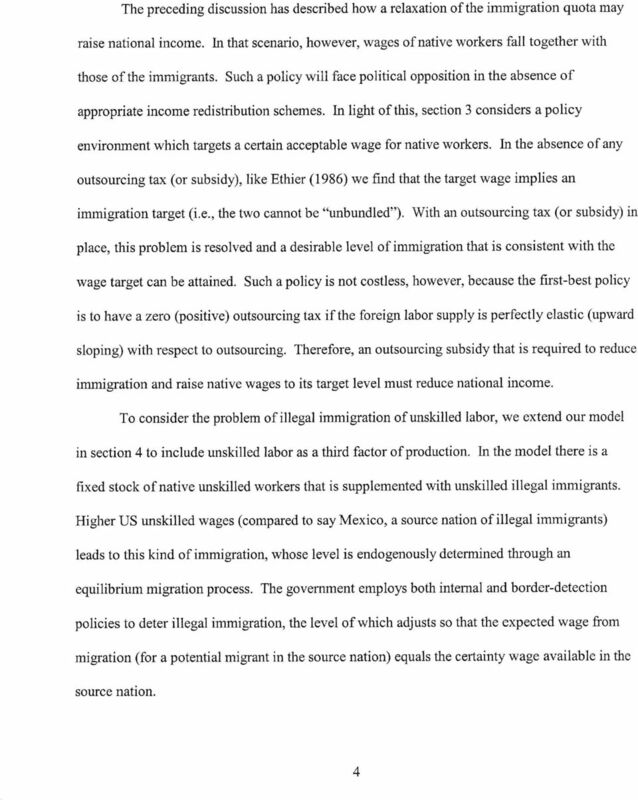 A higher legal immigration quota will lead to more illegal immigration if skilled and unskilled labor are complements in production. 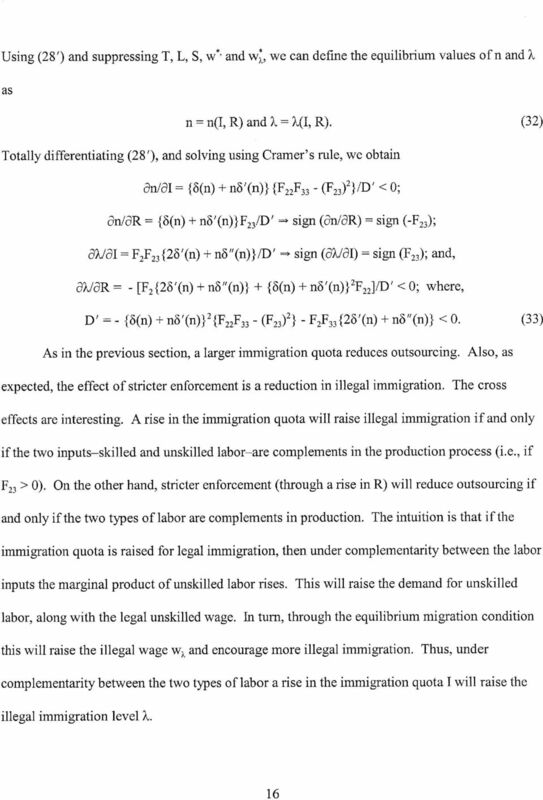 If the two kinds of labor are complements (substitutes), national income increases (decreases) monotonically with the level of legal immigration. 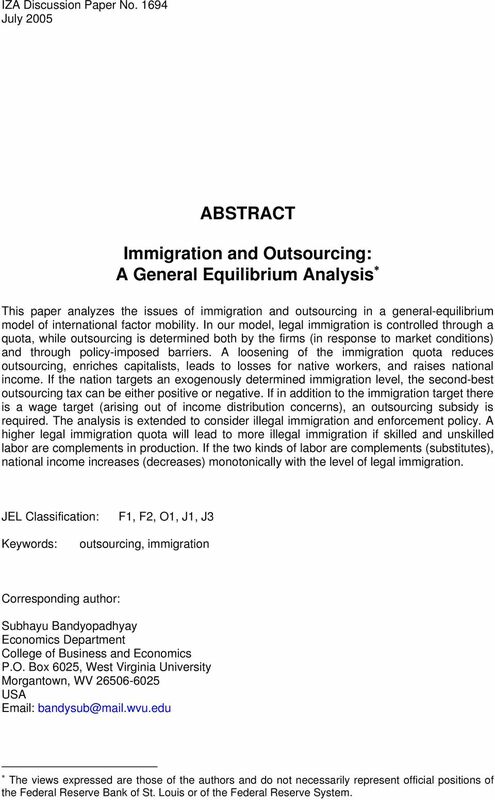 JEL Classification: F1, F2, O1, J1, J3 Keywords: outsourcing, immigration Corresponding author: Subhayu Bandyopadhyay Economics Department College of Business and Economics P.O. Box 6025, West Virginia University Morgantown, WV USA The views expressed are those of the authors and do not necessarily represent official positions of the Federal Reserve Bank of St. Louis or of the Federal Reserve System. Hubener, Andreas; Maurer, Raimond; Mitchell, Olivia S.
Working Paper Does retailer power lead to exclusion? Provided in Cooperation with: National Bureau of Economic Research (NBER), Cambridge, Mass. Article Does increased price competition reduce entry of new pharmaceutical products? Working Paper Morpheus: Remote access to micro data with a quality measure. Working Paper Series des Rates für Sozial- und Wirtschaftsdaten, No. Article Capital gains taxes and equity prices. Provided in Cooperation with: National Bureau of Economic Research (NBER), Cambridge, Mass. Conference Paper Quo Vadis German Scholarly Communication in Economics? Working Paper An exact non-cooperative support for the sequential Raiffa solution. 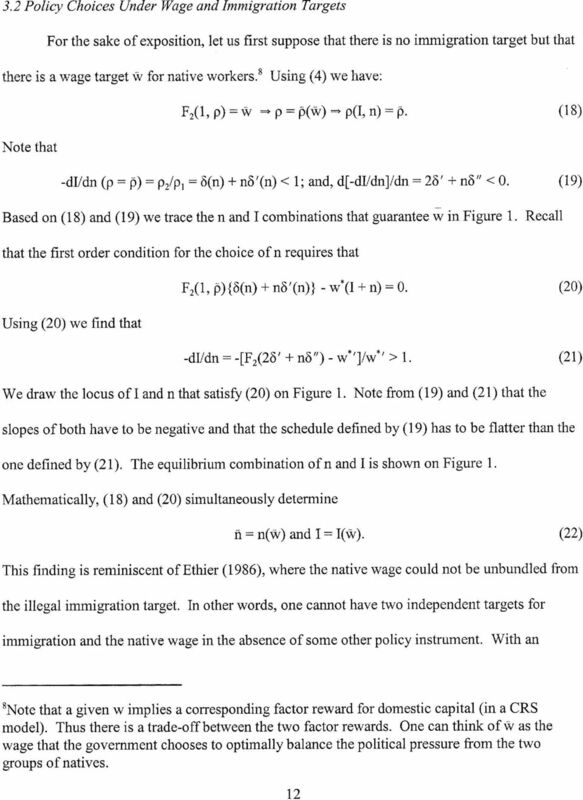 Working papers // Institute of Mathematical Economics, No.